A look at some of the power players in Washington that you might not know. Washington (CNN) -- Standing behind the president during a bill signing is a shining moment for any policy activist. For Paul Rieckhoff, it came last week when President Obama signed the Veterans Health Care Budget Reform and Transparency Act into law. 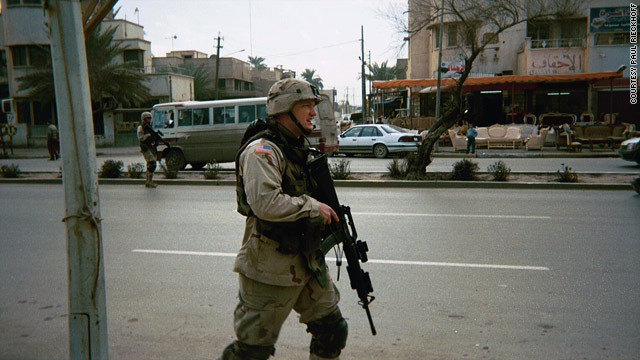 Having served in the Army for six years and as an infantry platoon leader in Iraq, Rieckhoff knows something about the challenges active-duty soldiers face overseas and later when they come home. Rieckhoff's experience inspired the 30-something executive director and founding member of the nonpartisan Iraq and Afghanistan Veterans of America to challenge the way the country supports veterans. "We can say we really got something significant done," he said on a warm fall day near Capitol Hill. "We used all the tools in our arsenal, ranging from our e-mail list to Facebook to Twitter to folks on the ground, to push forward a really transformative piece of legislation that's going to help a lot of vets." The IAVA notes the new law will provide "timely, predictable funding for veterans' health care by requiring Congress to approve a health care budget for the Department of Veterans Affairs (VA) at least one year in advance." Rieckhoff has come a long way from combat in Iraq. Tailored suits and policy papers now replace his military uniform and M-16. His behind-the-scenes work has helped shape legislation. And he has the ear of Washington, including House Speaker Nancy Pelosi, members of Congress and even President Obama. "We work most often with the House and Senate Veterans Affairs Committee ... and now with the [House] Speaker," he said. "She's really been fulfilling her promises [to veterans]. She said she was going to pass an increase in the VA budget. She did that. She said she was going to push the G.I. bill forward. She did that." But he said he doesn't like the way Washington works. He lives in New York City but frequently commutes to the nation's capital. "I spend a lot of time here, but I don't really like it that much, to be honest with you," he said as he walked in front of the White House. And he doesn't like politics, either. "I don't really want to go into politics primarily because I don't like raising money ... unfortunately, I think a huge part of your job in Congress is raising money." Washington didn't like Rieckhoff when he returned to the states in 2004. He stirred political waves for taking a very public stance against the Bush administration's handling of the war. "[When you're in Iraq] you really have to put your personal politics in your back pocket. ... And when you get home, you have time to reflect. You have time to think about the bigger political dynamics and some of the social fights that veterans faced." Then on the first anniversary of then-President George W. Bush's infamous speech aboard an aircraft carrier with a "Mission Accomplished" banner behind him, Rieckhoff delivered the Democratic radio response. "My question for President Bush -- who led the planning of this war so long ago -- is this: When will you take responsibility for the decisions you've made in Iraq and realize that something is wrong with the way things are going?" he said in the address. "Mr. President, our mission is not accomplished." "I spend a lot of time here [Washington] but I don't really like it that much to be honest with you"
His passionate plea to the president for a change in Iraq policy gained the attention of the Pentagon, Rieckhoff says in his 2006 book, "Chasing Ghosts," and elicited heavy criticism. But he also found a wave of support, especially from veterans. "When I got back, I really felt a disconnect," he said. "There was no voice for the veterans movement. There weren't folks talking about the issues that impacted us like traumatic brain injury, education issues, what was going on in places like Walter Reed [military hospital]. So there was a real disconnect. And when I got together with other veterans, I saw that they felt the same way." Thursday's signing ceremony at the White House was a high point for Rieckhoff, but the IAVA wants to address other issues, including mental health care, government accountability, homelessness and unemployment among veterans. "Right now we understand the next couple of years are critical," he said. "We've got to put all our energy and all our focus on veterans issues now so that we don't have the same mistakes in Vietnam."